Dozens of Israeli soldiers invaded, on Wednesday at dawn, the city of Tubas, in the northeastern part of the occupied West Bank, and clashed with many youngsters, before shooting one, and abducted him along with two others. Medical sources in Tubas said the soldiers shot Laith Daraghma with a live round in his left leg, and abducted him after allowing Red Crescent medics to provide him with the urgently needed treatment. 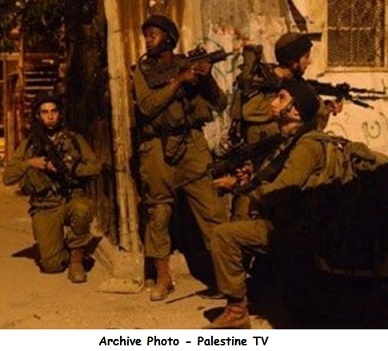 The soldiers also stormed and violently searched many homes in the city, and abducted No’man Sawafta and Hamad Abu Jabara.